This Altar Server Alb for boys or girls is made in Light-weight, Pure White, Perma Press Kodel, Poly Cotton Blend. Washable and Easy Care! It features tailored pocket openings, inverted pleat in back, raglan sleeves, lined and interlined capuche, and 23" front zipper. Can be worn with or without a cincture. Please Select your size. Also available in Flax Poly Rayon, see #555. 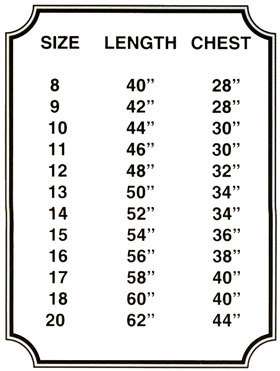 Click the IMAGES TAB above for size chart.